PrevPreviousBill Clinton regarding his reasons for going vegan. HUNTSVILLE, Ala. — Jimi Sitko gets up at 4 most mornings, works out two to four hours a day and can bench-press nearly twice his weight. He has a shaved head and a brightly colored tattoo on his left arm, and he can easily be mistaken for a Marine separated from his platoon. But most surprising is what is inside Sitko’s stomach: tofu, fresh greens and plant-based protein powder. Sitko is among a niche community of vegan bodybuilders. As the popularity of veganism has spread in recent years — fueled in part by a flurry of food-focused documentaries like “Super Size Me,” “Food, Inc.” and “Forks Over Knives” — its imprint can be seen in industries like publishing (VegNews) and fashion (hemp tote bags). It has even entered bodybuilding, perceived by many as a population of vein-popping men and women thriving off meat and artificial enhancements. Competitors like Sitko are forging a distinctive subculture of antibeef beefcakes who hope to change more of their competitors’ eating habits. There is little official data on competitive bodybuilders who are vegan, though the Web site veganbodybuilding.comhas more than 5,000 registered users. Denny Kakos, the president of the International Natural Bodybuilding Association, said he had no vegan bodybuilders entering his competitions in the late 1980s and early ’90s. 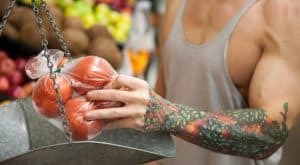 Today, vegans make up a sliver of the approximately 6,000 people who compete through the group each year, but they have been a steady, small presence since the 2000s, Kakos said. For some vegan bodybuilders, like Sitko, veganism was an attempt to improve diet and health. Others said that a vegan lifestyle reflected their personal beliefs about animal or environmental preservation. Still others regarded it as a form of rebellion against steroid culture. Kenneth G. Williams, a 44-year-old bodybuilder in Oakland, Calif., is a vegan who has taken on traditional bodybuilders and won. Bodybuilders have long been known for maintaining highly restrictive diets, often low in carbohydrates and high in protein and calories, meticulously timed with arduous workout schedules. They aim to have big muscles and little fat, which may require cycles of adding weight, then chiseling away fat to make muscles pop like He-Man’s. Nutritionists remain divided on the implications of adding vegan requirements to the already arduous bodybuilder diet, and caution that any extreme diet be undertaken with heavy research. The need for specific, vegan-friendly bodybuilding advice helped create the career of 31-year-old Robert Cheeke of Corvallis, Ore. He gives motivational lectures, sells vegan-themed T-shirts and gym bags and wrote a book about vegan bodybuilding that discusses how he went from 120 pounds as a teenage vegan to 195 pounds today. Cheeke said he was now focused on plant-based eating, including kale, avocados, beans and spinach, much of it organically grown in his garden. In 2003, Cheeke founded veganbodybuilding.com. The site hosts forums for vegan recipes (“Hemp-fu pudding”), strength training (“Barbell vs. Dumbbell? Pain?”) and vegan dating (closed to nonmembers). Giacomo Marchese met Dani Taylor, a bodybuilder living near him in Massachusetts, through a “Vegan Vacation” organized through the site in July 2008. Marchese proposed last August and the two, both still vegan and still bodybuilding, are planning their wedding. “The Web site and community of vegan bodybuilders changed my life,” Marchese said. The site is also a place for getting advice. Before strutting before judges, some bodybuilders recommend quickly chugging an alcoholic drink or eating something sugary to make their veins — and therefore their muscles — pop. Kenneth G. Williams, a 44-year-old bodybuilder in Oakland, Calif., is a vegan who has taken on traditional bodybuilders and won. But first, there was the stigma. In 2003, Williams became vegan. In 2004, he won his first competition. 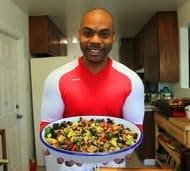 Williams is now a raw vegan; he said he never heated his food above 112 degrees Fahrenheit. A version of this article appeared in print on January 5, 2012, on page B10 of the New York edition with the headline: Sculptured By Weights And a Strict Vegan Diet.